I have about a hundred 78rpm records. I don’t search for 78rpm records, but when I find a good one, I take it home. Because my record player can’t play 78rpm records, I wait until I have enough records to hook up an old record player and record all the new 78’s on a minidisc. Last night I was spending a nice evening listening to 78’s. I like fooling around with record players and recorders, so I don’t mind when the records are not all that great. 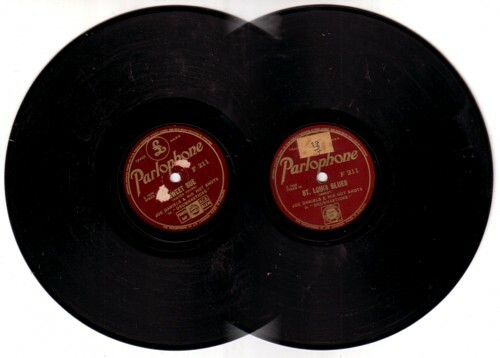 But I am always surprised by the many good songs I discover on 78rpm records. And I like the sound of these records! 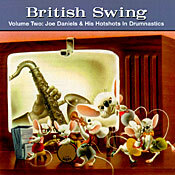 The best thing I heard last night was a record by Joe Daniels & his Hot Shots. He plays versions of St Louis Blues and Sweet Sue . Not particularly the kind of songs that make my heart beat faster, but on the label was also the word “*Drumnastics*”, and that made me buy this record. I had never hears of Joe Daniels, but i recognise a code word when i read one, and you don’t have to be Dan Brown to figure out that any record with the word Drumnastics on it is worth 50 eurocents. The songs reminded me of the music of Raymond Scott. I just googled Joe Daniels and learned that there is a CD out on VIP Records with more of his Drumnastics. I have put the CD on my want list, because anybody who plays Powerhouse is worth $12.50. Actually there are two CD’s out; one is mix of music by Ambrose and Joe Daniels. The titles of the repertoire seem very promising to me! To my surprise the two tracks on my 78rpm record are not on the VIP CD’s. I hope this is because they are not as good as the tracks that VIP re-released. Here is some surface noise from my old 78rpm record player.